Stomach flu, or influenza, is a viral infection that causes inflammation of the stomach and intestines. Stomach flu typically leads to significant loss of fluids due to vomiting and diarrhea. Drinking plenty of fluids is important in order to avoid dehydration. Acidic fruit juices, such as orange juice, are usually not recommended for upset stomachs, although many fruits contain compounds that are antimicrobial and may help to combat infections. Consult with your doctor if you have a stomach flu that causes excessive diarrhea or vomiting for more than a couple of days. Stomach flu is known medically as viral gastroenteritis because inflammation of the mucus lining of the gastrointestinal tract is the initial complication. Viral gastroenteritis is a leading cause of severe diarrhea in both adults and children, according to MedlinePlus, and it is caused mainly by the rotavirus and a few other viral types. These viruses are often found in contaminated food or drinking water, and lead to symptoms within 48 hours but often within just a few hours. Those with the highest risk for severe stomach flu include infants, the elderly and people with a compromised immune system. The main symptoms caused by stomach viruses include abdominal pain, nausea, vomiting, diarrhea, achy muscles and fever. The most serious complication of severe stomach flu is dehydration due to excessive loss of fluids. Without replenishing lost water and electrolytes, such as sodium and potassium, dehydration from stomach flu can become a medical emergency within 48 hours. Signs of dehydration include confusion, dizziness, fatigue, headache, extreme thirst, low blood pressure and heart palpitations. The main issue with the stomach flu is that it is difficult to keep fluids in your body for a significant amount of time. Home remedies for treating the stomach flu primarily involve preventing dehydration and replenishing minerals and electrolytes. Most medical authorities recommend not drinking fruit juice because they believe the acidity irritates the stomach and the fructose sugar may exacerbate the large intestine and promote more diarrhea. Instead, water, electrolyte solutions and diluted chicken soup are often recommended. After replenishing your fluids, the BRAT diet is recommended to replace lost minerals and vitamins. The BRAT diet is an acronym for Bananas, Rice, Applesauce and Toast, which are mild foods least likely to irritate your gastrointestinal system. Fresh-squeezed juice is less acidic and contains less sugar compared to juice derived from concentrate, according to "Contemporary Nutrition: Functional Approach." Fresh citrus juices are also rich in citric acid and vitamin C, which display both antimicrobial and antioxidant properties. Consequently, fresh orange or grapefruit juice may help to combat the stomach infection and reduce the duration of the illness. Less acidic fruit juices include blueberry, papaya and peach. 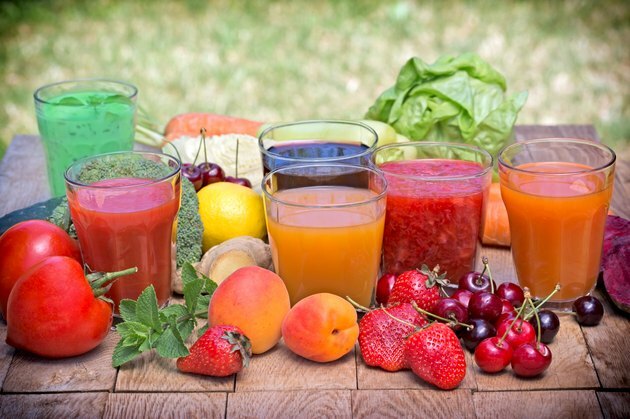 Fruit juices also contain a variety of vitamins, minerals and electrolytes. Perhaps a good strategy is to wait until you have stopped vomiting and then mix fresh juice with water in a 50:50 ratio. If the mixture worsens your diarrhea, then discontinue. Talk to your doctor about how to combat the stomach flu safely at home.